Hamilton, Bermuda, October 24, 2018 – With its commitments to alcohol responsibility, disaster relief efforts, women’s empowerment, and significant reductions in greenhouse gas emissions and water usage, Bacardi Limited solidified its position as a socially and environmentally responsible leader, as demonstrated in the company’s 2018 Corporate Responsibility (CR) Report. As a signatory to the United Nations Global Compact,and in alignment with the United Nations Sustainable Development Goals,Bacardi’s CR efforts are fueled by its expanded “Good Spirited” platform. 2017 represented the last year for reporting on the Producers’ Commitments to Reduce Harmful Drinking. During this timeframe, Bacardi, often in partnership with others in the industry and through country-level associations, implemented 44 responsible drinking education programs in 16 countries, and reached nearly four million individuals with underage drinking prevention education. While the five-year initiative has concluded, Bacardi remains committed to continuing the spirit of the five commitments and the 10 action areas, including finalizing new, responsible, and robust industry standards to ensure its digital advertising only targets adults of legal drinking age who choose to drink. By prioritizing environmentally sustainable practices, Bacardi reduced greenhouse gas emissions intensity 59% over the last 12 years, and improved overall water use efficiency 50% as compared to its 2006 baseline. 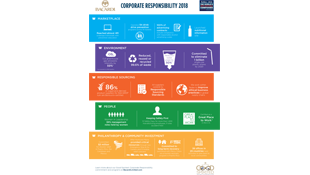 In addition, less than 1% of waste was sent to landfill in fiscal year 2018, with 11 manufacturing sites achieving Zero-Waste-to-Landfill. It also proudly sources sugarcane-derived products for BACARDÍ® rumin a responsible way – 86% certified by international sustainability nonprofit Bonsucro – and remains committed to eliminating one billion single-use plastic straws by 2020 through its recent collaboration with the Lonely Whale. In December 2017, the company committed to providing consumers nutritional information about its products, with the launch of its nutrition pages on www.BacardiLimited.com, with plans to continue adding products and global markets to its current lineup. Along with being certified as a Great Place to Work® in the United States, Bacardi was also named among Forbes2018 World’s Most Reputable Companies for the sixth consecutive time, as part of the annual Global RepTrak® 100 list compiled by the Reputation Institute. Bacardi continues to invest in its people. Its Women in Leadership program is a company-wide initiative to unleash the potential of current and future female leaders at Bacardi to drive sustainable top and bottom line business growth. A mentoring program for junior employees was expanded to Eastern Europe, and the company increased its support for the S.H.E. Summit in North America. It also kicked off its Spirit Forward program to support women in the hospitality industry. At the end of fiscal year 2018, Bacardi had 36% of leadership positions held by women. To give back to those in need following the destruction caused by Hurricane Maria in September 2017, Bacardi Limited and the Bacardi family committed US$3 million to disaster relief in Puerto Rico and other areas affected by natural disasters, supporting multiple organizations providing relief services and organizing efforts to support those directly impacted. The Bacardi “Emergency Stop & Go” centers and mobile caravans provided distribution of food, water, and critical supplies throughout Puerto Rico. Bacardi remains committed to long-term recovery in Puerto Rico and other areas through its tourism recovery program in partnership with global humanitarian organization, Mercy Corps. Throughout fiscal year 2018, 38 Bacardi offices in 29 countries held volunteer activities to give back to local communities, as part of its annual CR Month initiative. To read more about Corporate Responsibility within Bacardi, check out the complete FY18 Corporate Responsibility Report, which encompasses April 1, 2017 – March 31, 2018, online at www.BacardiLimited.com. Founded more than 156 years ago, in Santiago de Cuba on February 4, 1862, family-owned Bacardi currently employs more than 7,000, operates more than 20 production facilities, including bottling, distilling and manufacturing sites in 11 countries, and sells its brands in more than 170 countries. Bacardi Limited refers to the Bacardi group of companies, including Bacardi International Limited. Visit www.bacardilimited.com or follow @BacardiLimited.